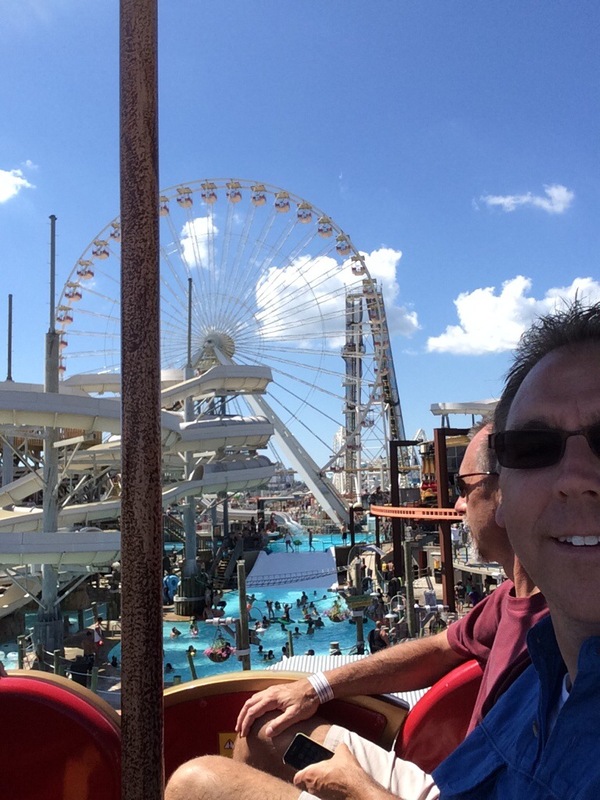 Note: somehow my post from Great Adventure and Coney Island was deleted. I will reconstruct that when I get home in case you missed it! 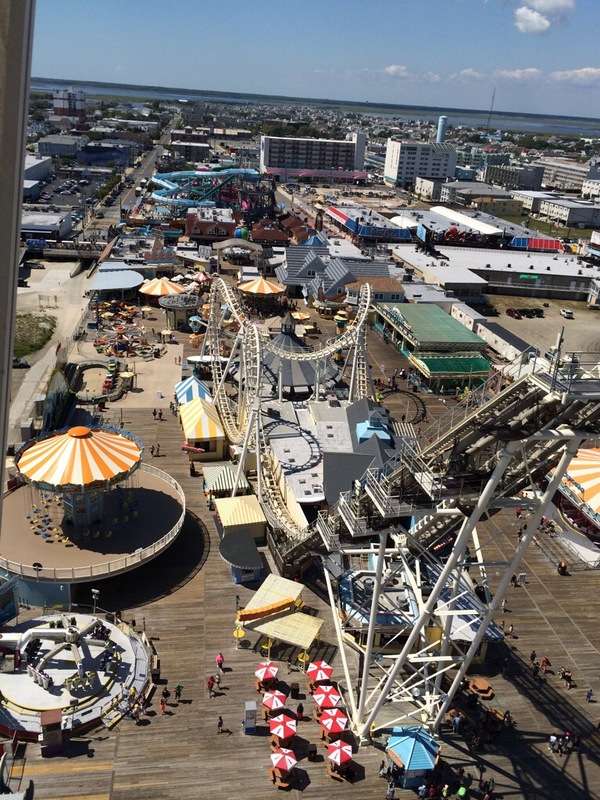 A lovely drive through New Jersey brought us to the iconic Jersey shore and Morey’s Piers. 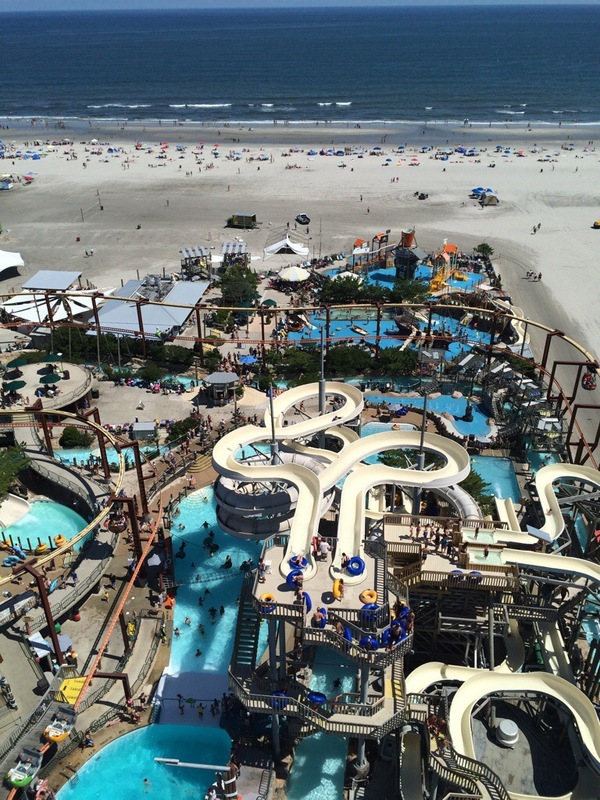 Morey’s is a collection of three amusement piers that jet out from the boardwalk to the ocean. 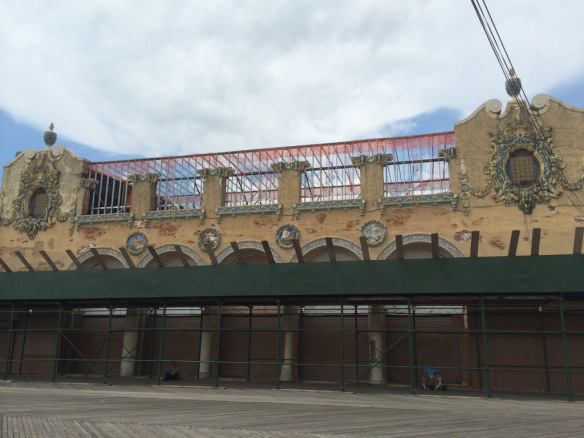 Even though they are attached to the boardwalk, it’s a much different (and better) world once you step on to one of the piers. Since we drove all morning, our first stop was lunch with Dino Fazio, Director of Operations at Morey’s. While he had to work or something silly like that, George Rohman also stopped by. We had to pose for one of his famous selfies! Lunch at the Stubborn Brothers cafe was amazing… Great company, stupendous breeze off the ocean and very tasty food! Then it was off to explore the piers. It’s incredible what they have been able to achieve, especially in terms of space management. There is very little unused space, yet it didn’t seem crowded. Of course we have to mention that all of the restrooms we visited, on all three piers throughout the day, were impeccably kept and spotless. Some of the cleanest restrooms in the industry. No pics of that, though. That would be creepy. Much of the day was spent observing all the cool things the piers had to offer. 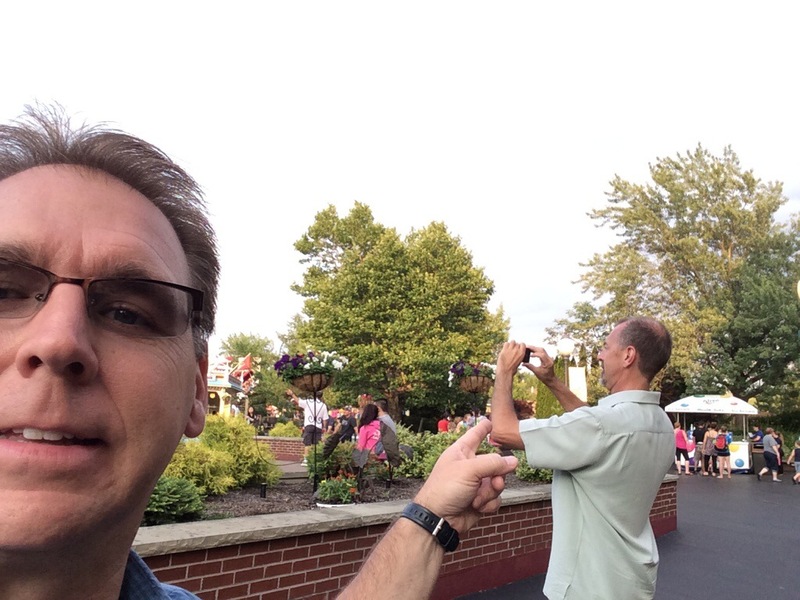 How should we document all that, with a triple selfie, of course! 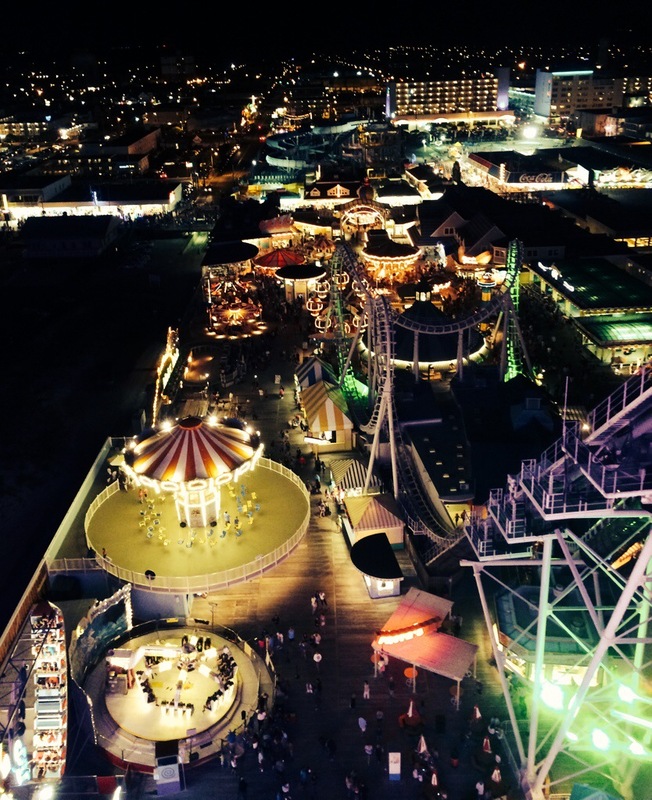 Of course the boardwalk and pier really come alive at night, and it’s literally a different world. 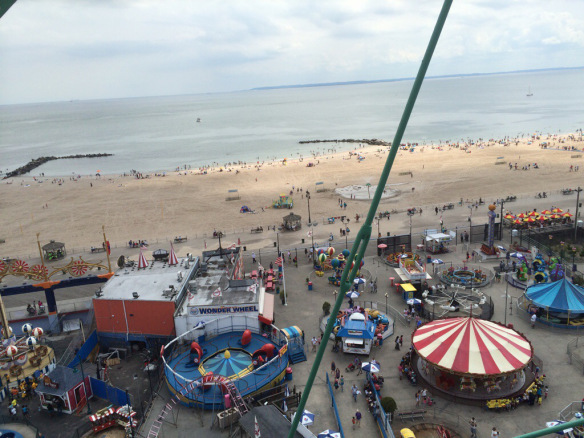 We got on (our third) Ferris wheel ride just as the fireworks over the beach were starting. Made for a great viewing spot. 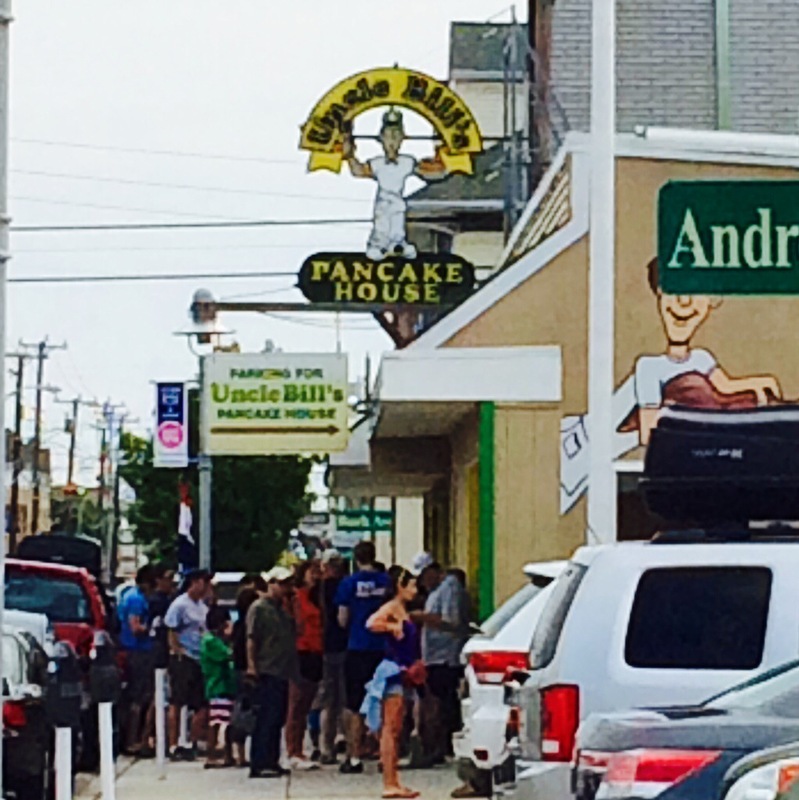 One last walk to the beach, breakfast at local favorite (peanut butter pancakes at Uncle Bills Pancake House), then it was off to Six Flags America! Six Flags America turned out to be a fitting end to the trip. They have a coaster (Superman, Ride of Steel) that is a mirror image of one of the first coasters we rode at Darien Lake. It was great to bookend the trip with two great airtime coasters. Also great seeing SFA peeps Joe Pudlick and Alex Reszitnyk (unfortunately no pics). But we did get a pic with Linda Gerson, who drove out to spend the day with us! So fun! 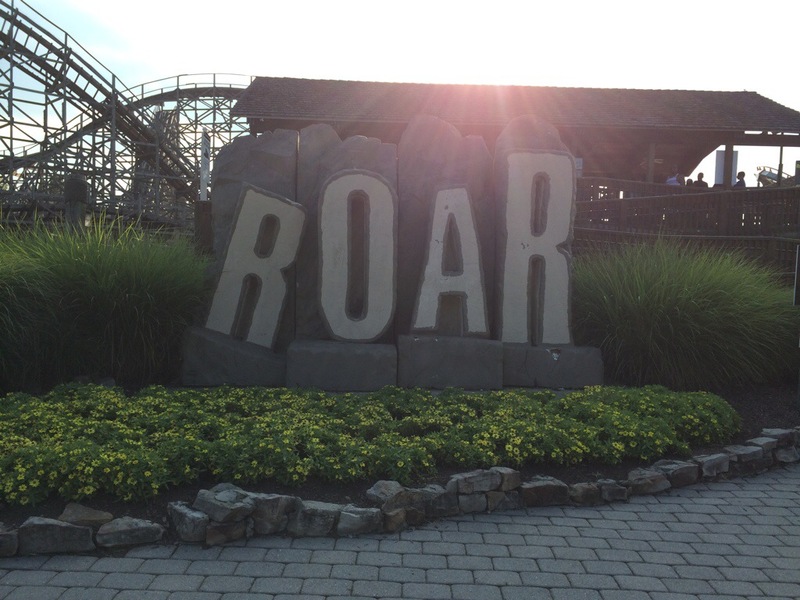 Another hit at SFA was Roar, a fun wooden coaster that is “fun rough “… Just rough enough to be fun and exhilarating without beating us up! As I expected I would, I preferred the back seat. As the sun set on another EPIC trip, I can’t help but wonder about where we’ll go next year. I think no matter where we go, with Alan and Darren as the other nerds along for the “ride”, it will be beyond epic… And I’ll be ready to go!!! The last two days have been a bit of a blur, but this I know. They were epic! 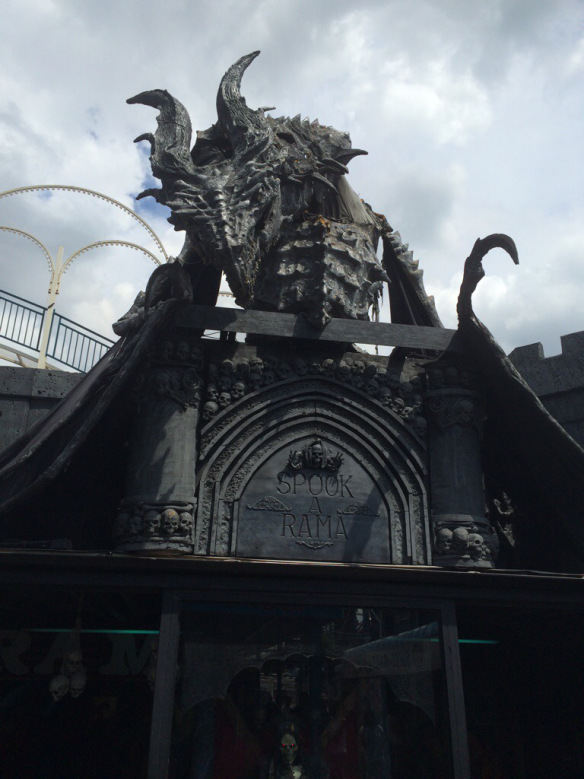 Our 4th park on the trip was Six Flags Great Adventure… And what a fun adventure it was! We started the day with a bit of a Griswold moment… Just about the first ones to arrive! We did not, however, park in the back of the parking lot. That decision would prove to be a wise one later! 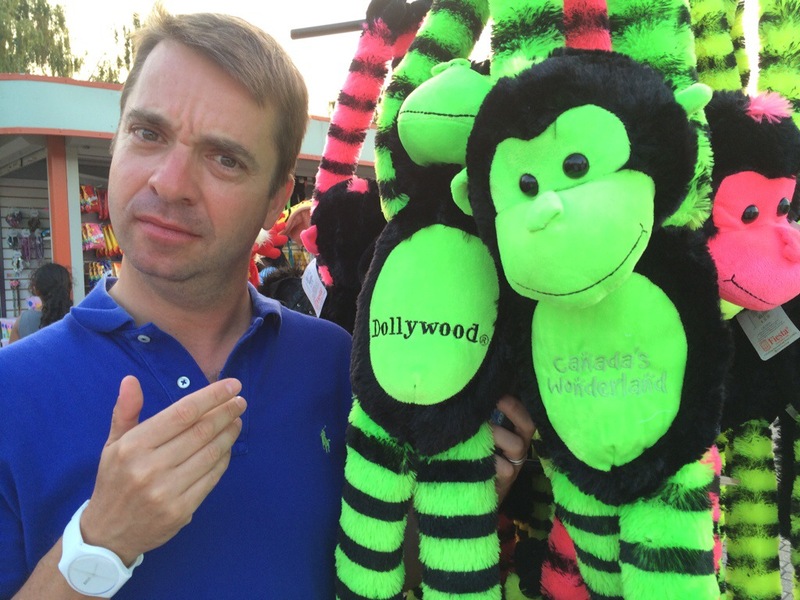 And just like the Griswolds, we wanted to know where the big rides were, and there were plenty to choose from. 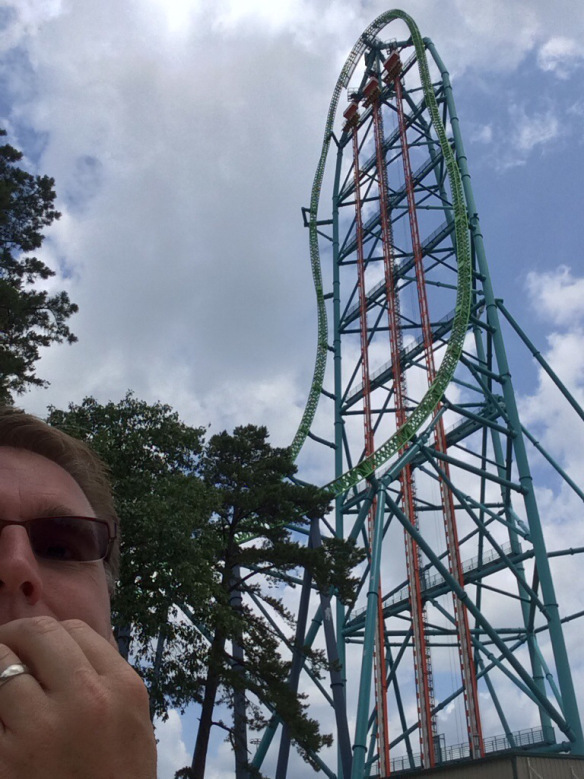 Kingda Ka (the big green roller coaster) is the tallest, and one of the fastest on the planet… 456′ tall and 128 mph! Waited for the front seat and did it twice! 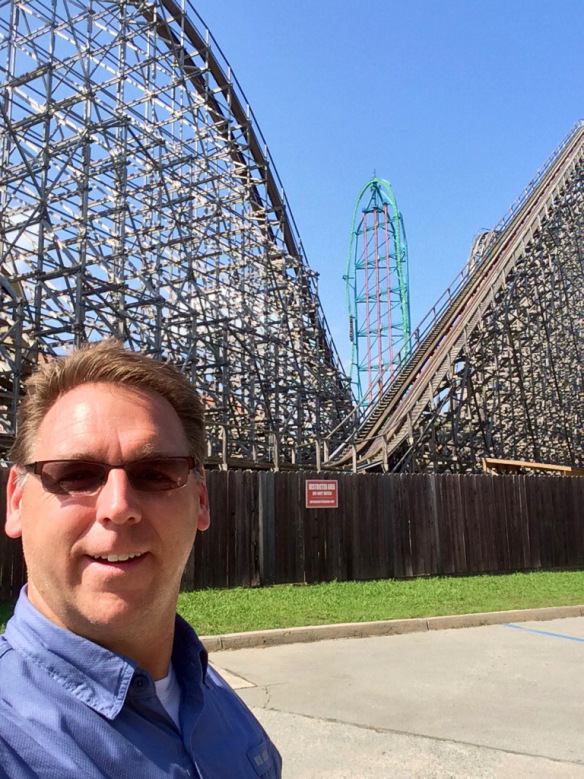 The Zumanjaro Drop of Doom (inset within the structure of Kingda Ka) is the tallest drop ride of any in the world at 415′. I’ll admit I was a little nervous about that one, but it was more fun than scary. Yep, did that one twice, too. 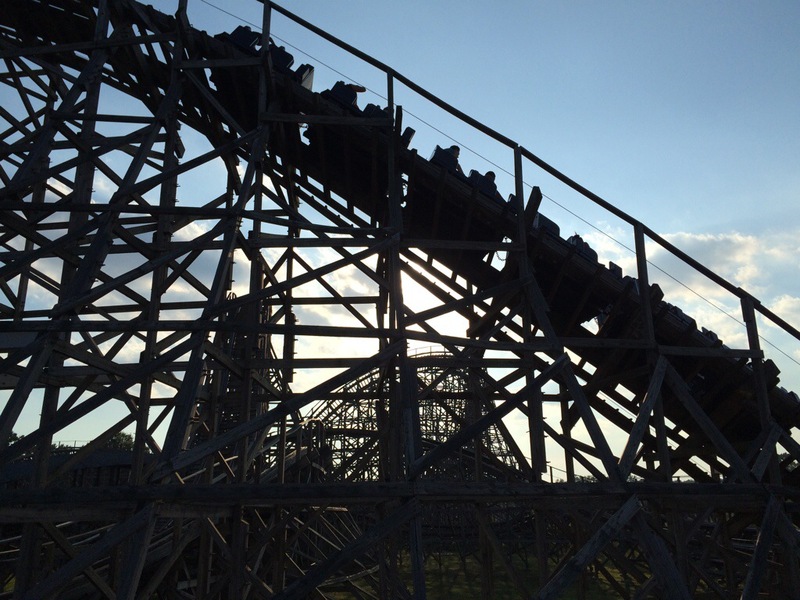 For big wooden coasters, there is no equal to El Toro. Fast, smooth, and aggressive airtime. 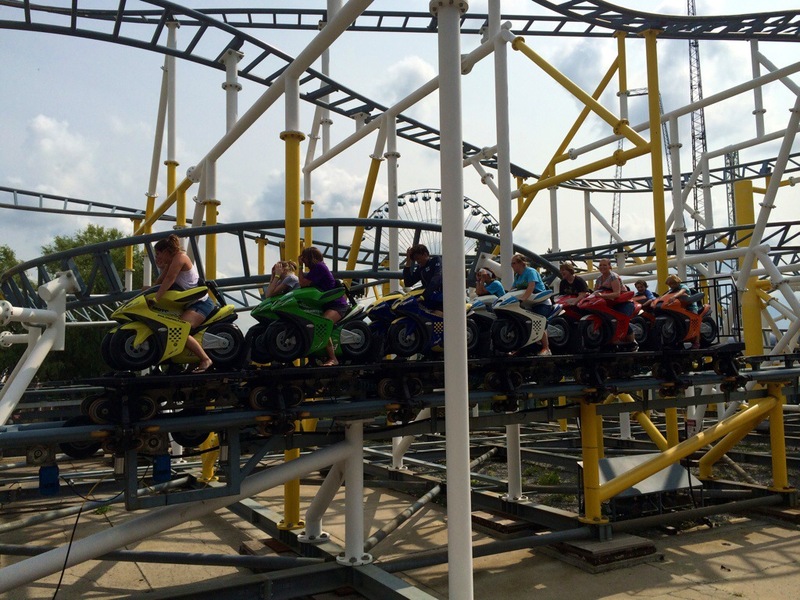 A super fun ride that packs a punch in the front OR back – and we did it all! 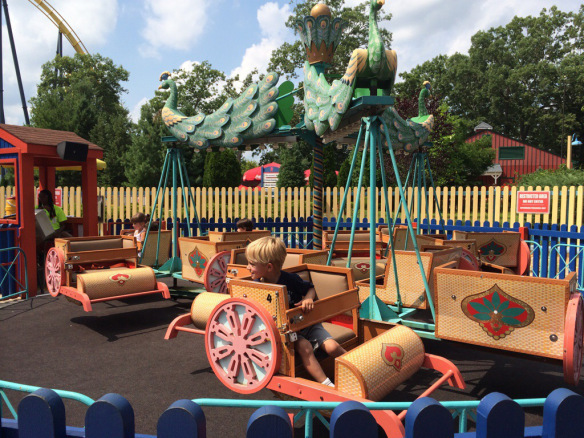 In addition to big rides, Great Adventure has a great selection of kiddie rides, including the smallest Scrambler I have ever seen! As they say in Minnesota, it’s “oh fer cute”! 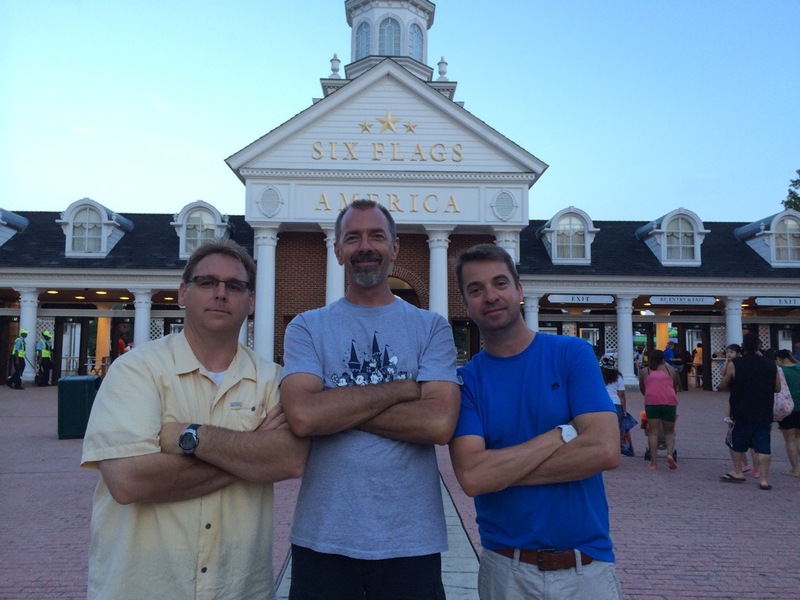 One of the non-ride related highlights was running into two great Six Flags leaders, Mark and Robbie. And of course, we had to take a groupie! 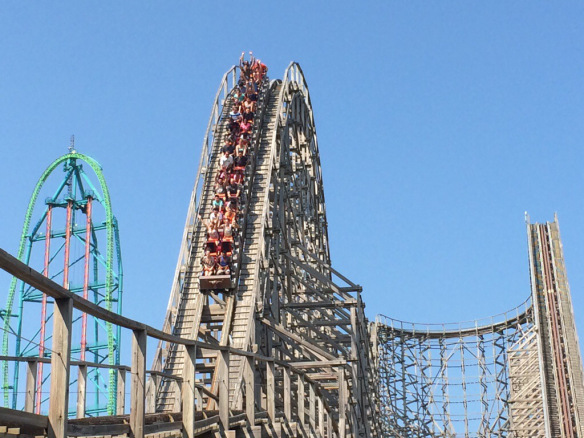 Mother Nature was telling us our day was just about over, but we were trying to squeeze in one more ride on El Toro. 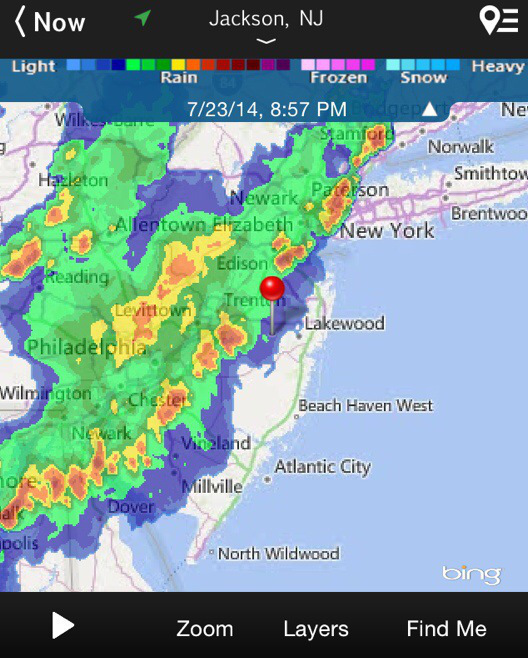 As we power walked across the park to beat the rain, we got word that everything was shutting down for weather. It was 9 pm, and with the weather that was coming, it was unlikely things would be opening back up soon. It was then that we were glad that we had parked so close… We got to the car just as the skies opened up. 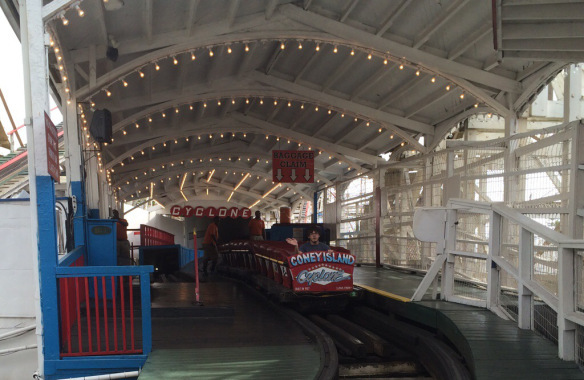 From adventure to history … Yesterday we boarded different kinds of trains to make our way out to Coney Island. 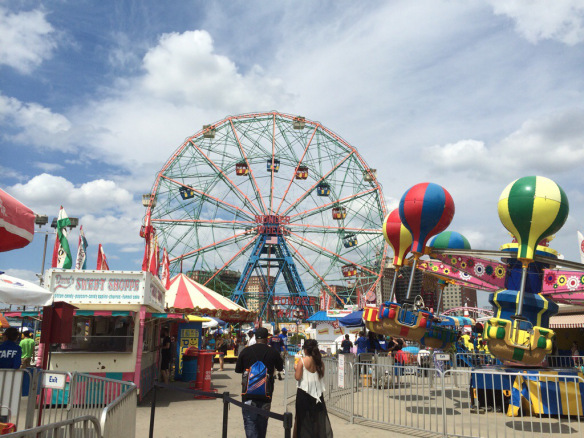 It was great to see the classics such as the Cyclone and Wonderwheel, as well as many of the historic and iconic signs and structures that would influence our industry for years to come. First stop, though? 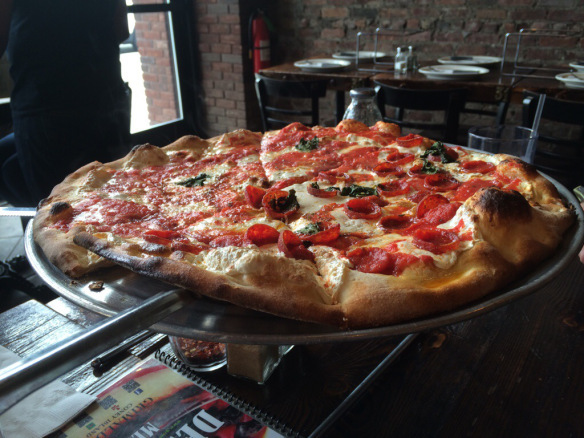 Grimaldi’s for an amazing pizza pie. The Cyclone was great! 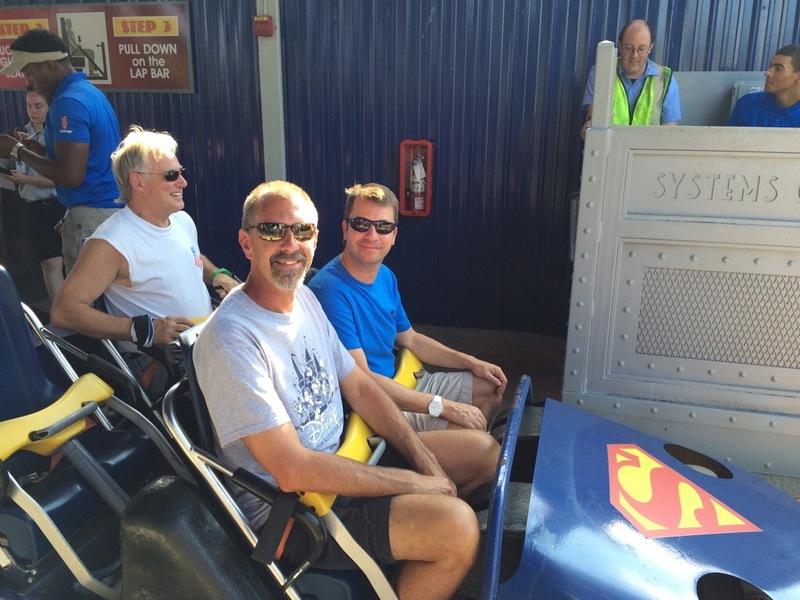 Not the biggest, tallest, or fastest ride in the universe, but a classic. Everyone who loves coasters and amusement parks needs to ride this at least once. You’ll get to ride a true classic, but also see just how far we’ve come. After two more train rides back to the hotel, it was time to recharge for our trip today to Morey’s Piers! So excited for the next batch of epicness! CNC ’14 – oh, the epicness! Our first stop (on the day we arrived) was at Darien Lake. 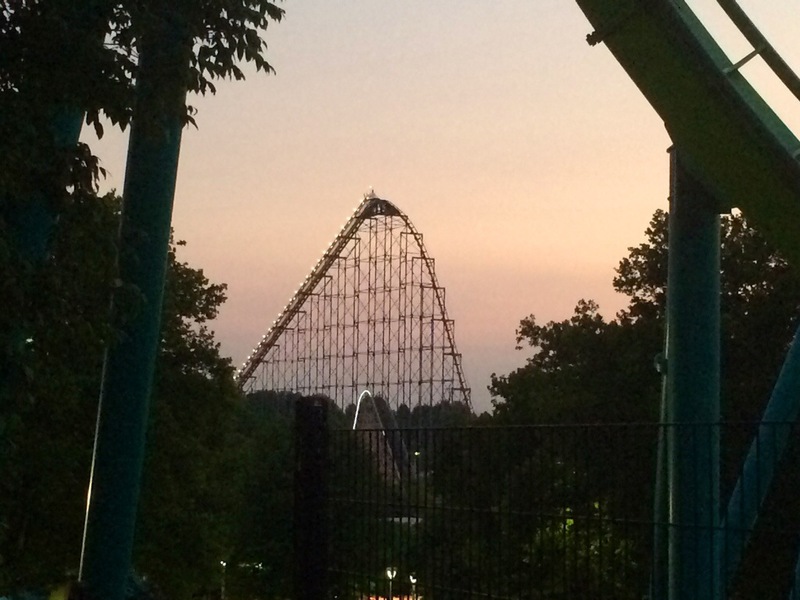 Had a great time exploring the park, and even a better time experiencing the airtime on Ride of Steel! Then it was off to Canada! 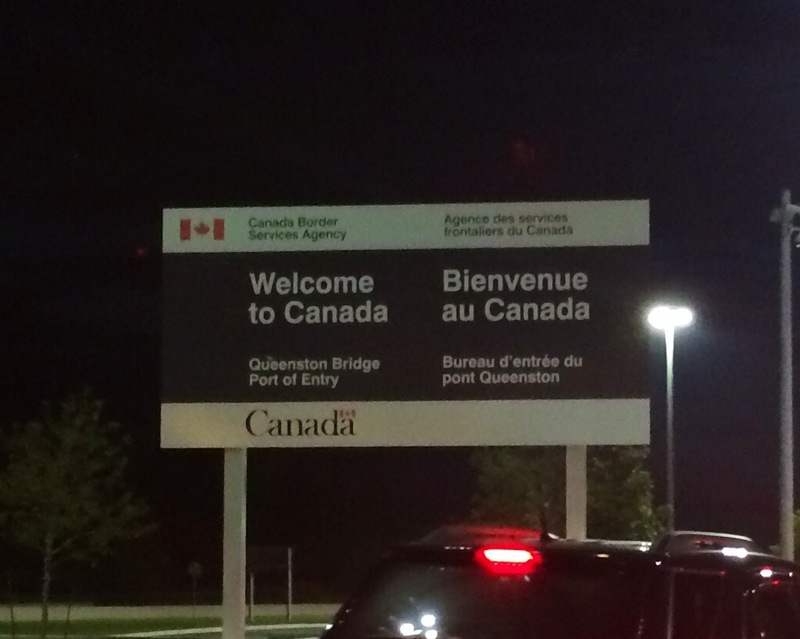 We made it across the border with little fanfare, although Alan was a little nervous about the boarder patrol asking to see in the back of the car. Not because we had anything to hide, but because it is a rental car and he wasn’t sure how to open the hatch from the drivers seat. Luckily, he didn’t ask. 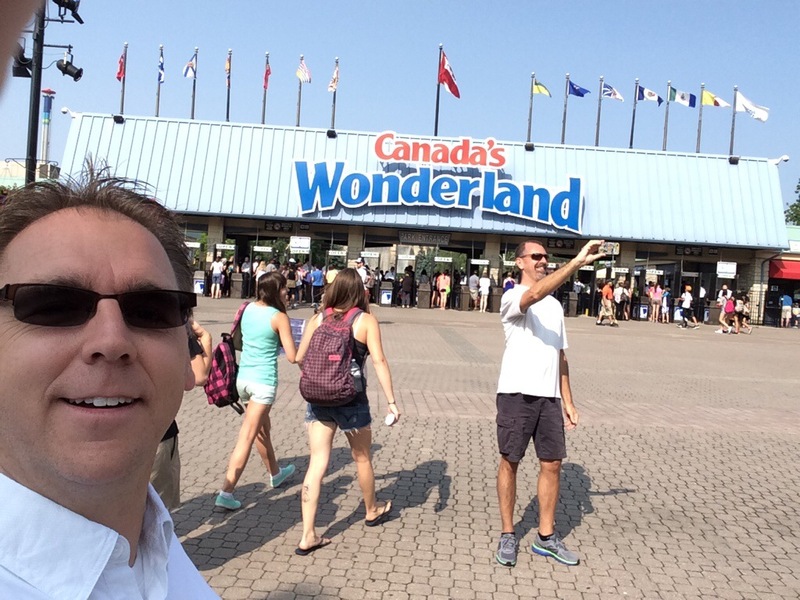 Had a fantastic day at Canada’s Wonderland! 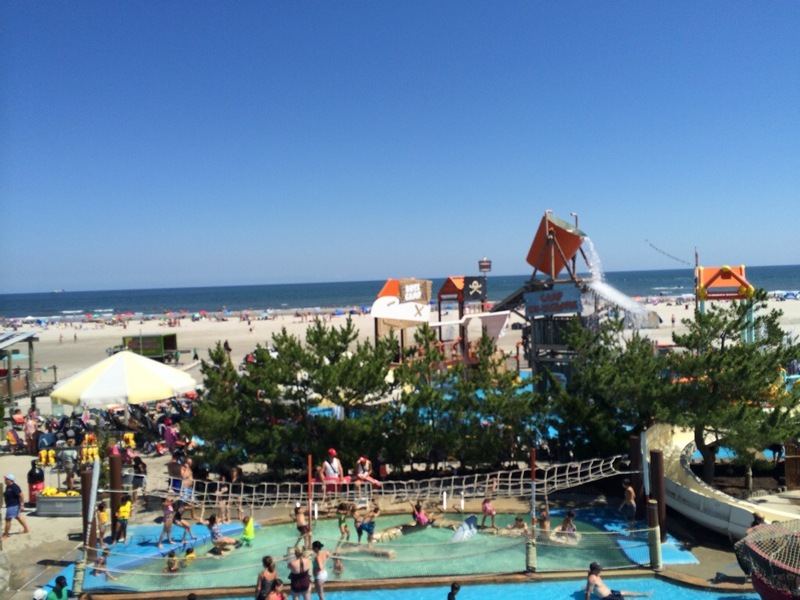 The park was clean, the staff was friendly and the rides, landscaping and grounds were incredibly well maintained. If you haven’t been to CW, it’s worth the trip!! 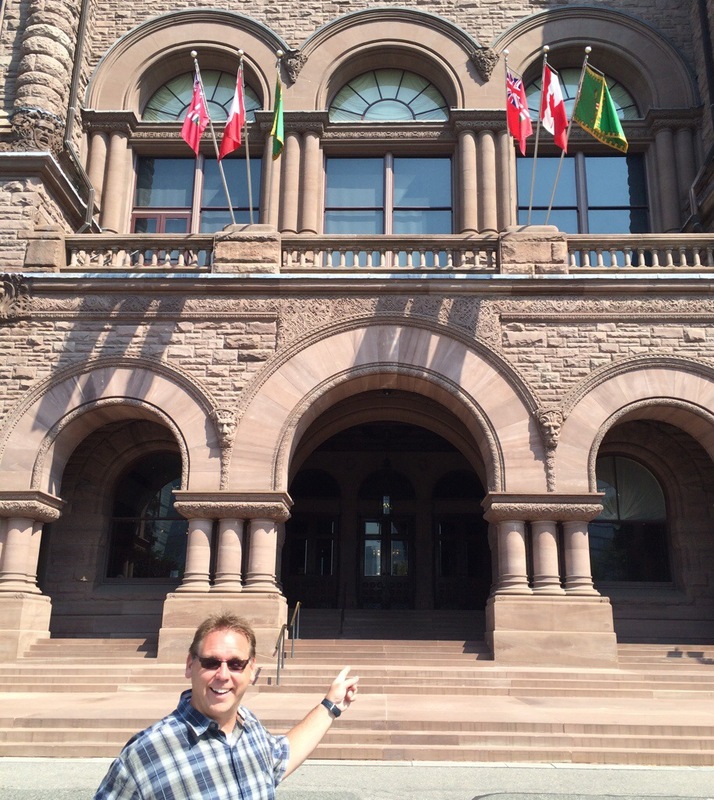 Before we left Toronto, we had to stop by the Parliament Building. Not for a civics lesson, but because this was the backdrop of the cover of one of my favorite albums of all time – Moving Pictures by Rush. That’s me right where the dudes in the red jumpsuits were literally moving pictures. 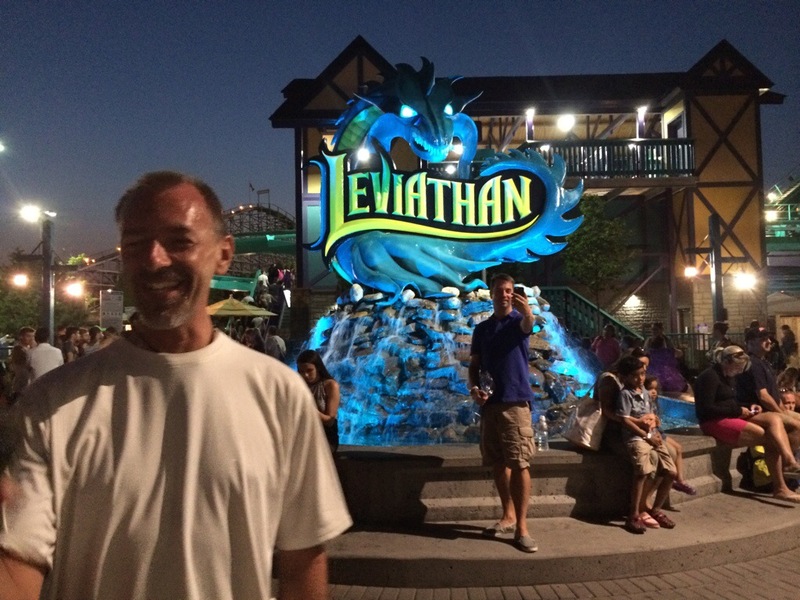 After a looong day of driving, we ended up at Dorney Park with only two hours of operation left for the day. 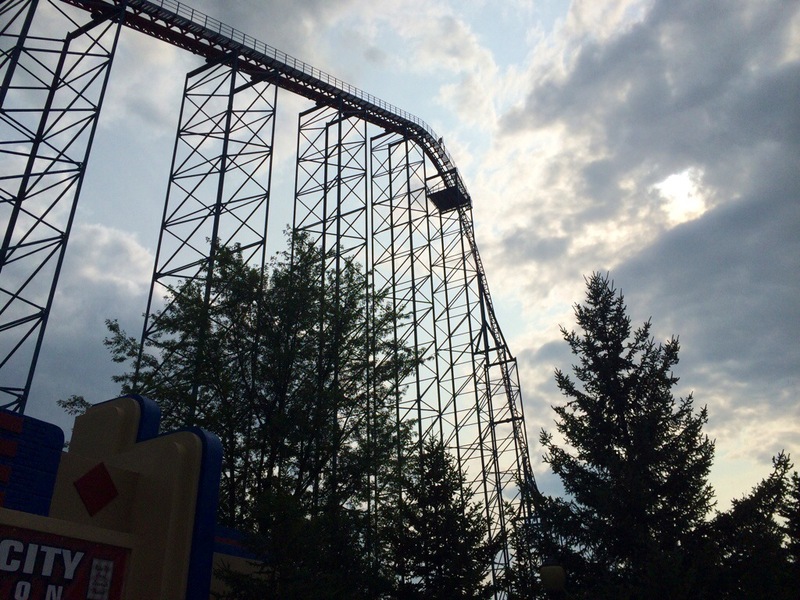 That was enough for us to get in 8 coaster rides, 4 of which were on one of our airtime favorites, Steel Force. 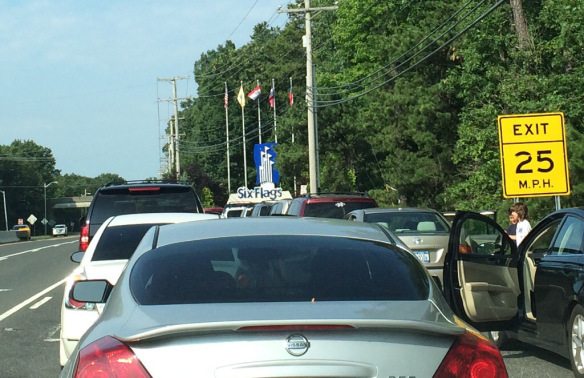 Another hour-and-a-half of driving landed us at our hotel in New Jersey. We are now getting ready to tackle Six Flags Great Adventure. The trip has already been quite an adventure… Uber excited to see what today brings. 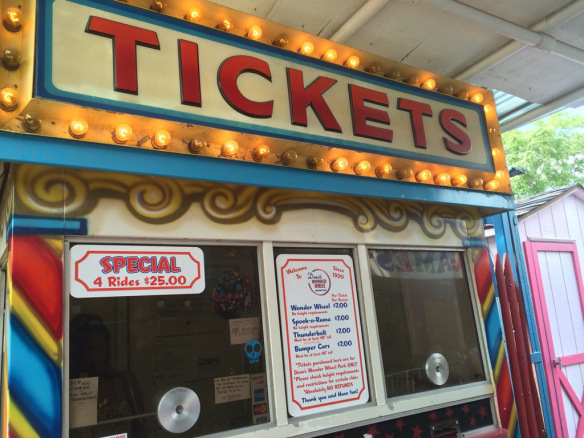 As I am getting ready to leave for my epic-mega-coaster-palooza-extravaganza tour, I started thinking about what sort of service experiences I would be expecting at the various parks we’ll be visiting. Since a person’s perception of the service they receive is largely subjective, you really could say that like beauty, quality service is in the eye of the beholder. So I might expect something different than my friends, and we might even interpret the exact same situation in very different ways. Now, you might think that as someone who writes about and teaches customer service tactics, I would have really high expectations. 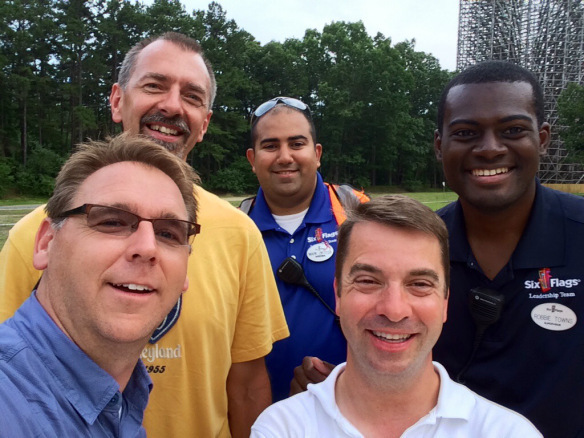 You might remember a story about Kordell who was a stand out employee on our trip last year. His behaviors were actually over-and-above my expectations, which is probably why he was so memorable. 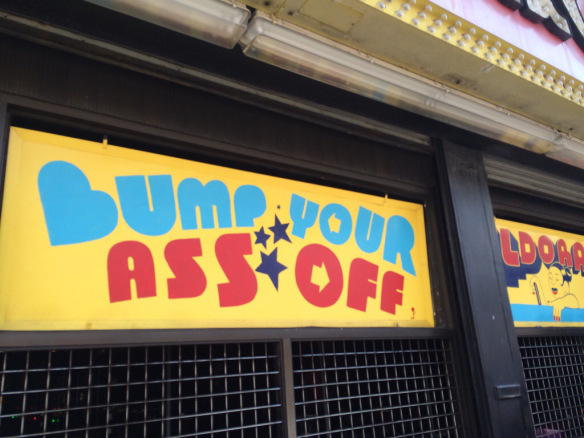 All I really want the employees to do is reinforce that I made the right decision to visit that particular business. So how do they do that? In my mind, it starts with a smile. It’s a cliche, and everyone talks about it, but that’s probably because it’s often the first impression we have of how that service interaction will go. It truly does set the tone. Second… Engage me in some way. Say hello, how ya doing, tell me you like my hat… Whenever you can do to acknowledge me as a person. It doesn’t have to be a huge gesture or a long conversation, but it does need to be sincere, and it helps (if conditions allow) for this to be accompanied by eye contact – but that’s not a prerequisite. 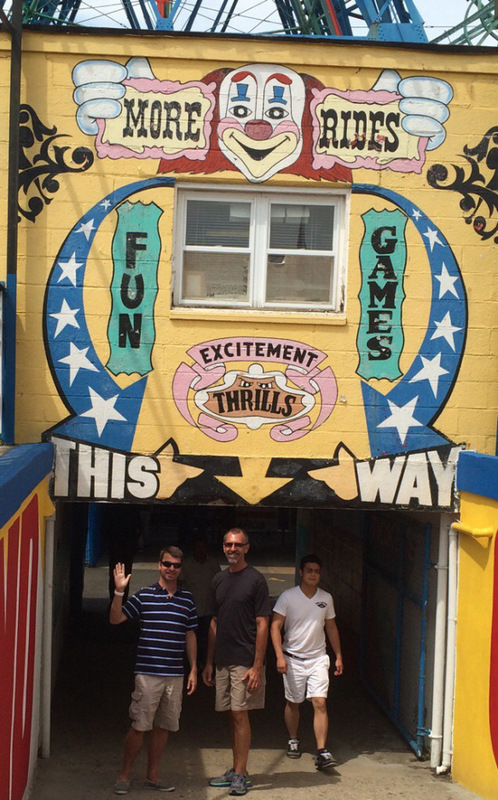 Last month I had the chance to go to Kemah Boardwalk, just south of Houston. 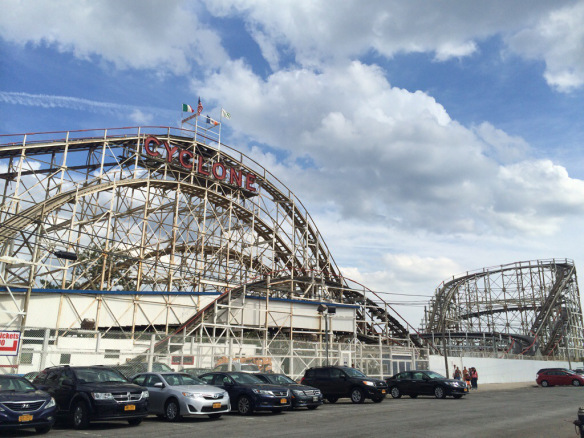 There is a wooden roller coaster there called the Boardwalk Bullet. It’s a great ride, but what enhanced my experience even more was the operator who was bantering back and forth over the microphone with the guests, myself included. When he noticed I had a little strap to hold my glasses on, he made a comment like, “this guy came prepared!”. When he saw a guest in line with a Teenage Mutant Ninja Turtles shirt, he jokingly said, “No turtles are allowed to ride.” He never spoke directly to me, but he made the experience much more fun and enjoyable. I took a few extra rides just to hear what was he was going to say. The final thing that makes a good interaction (in my mind) is some sort of send off. “Thanks for visiting”, “Have a great day”, yadda, yadda, yadda. Just SOME sort of acknowledgement that I chose to spend my time with you. For example, the other day I was at the grocery store, and the cashier was as pleasant as could be. The bagger wasn’t exceptional, but he wasn’t a dullard, either. What stuck with me was that when he was done bagging my groceries, there was no, “thanks”, no “enjoy the ice cream”… nothing. He crossed his arms and looked toward the next customer coming down the line. It was like as soon as my food was in the bag, I ceased to exist. I didn’t think it bothered me that much until I realized that that was the thing I remembered most about my experience there. It was last, and a lasting impression. So that’s it: Smile, engage me, and thank me. What are your expectations? Do you expect more or less? How about your guests? What do they expect? 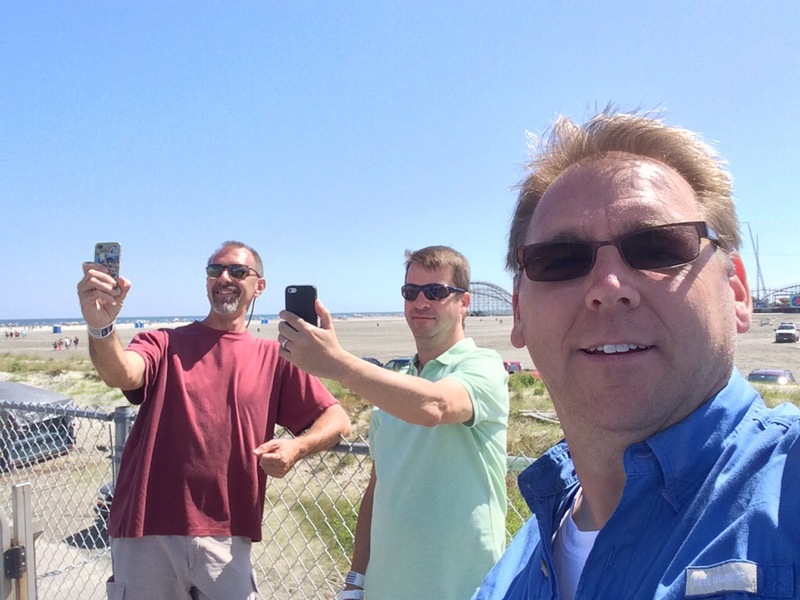 I’ll be reporting along the way on our trip… I’m excited to see how it goes! 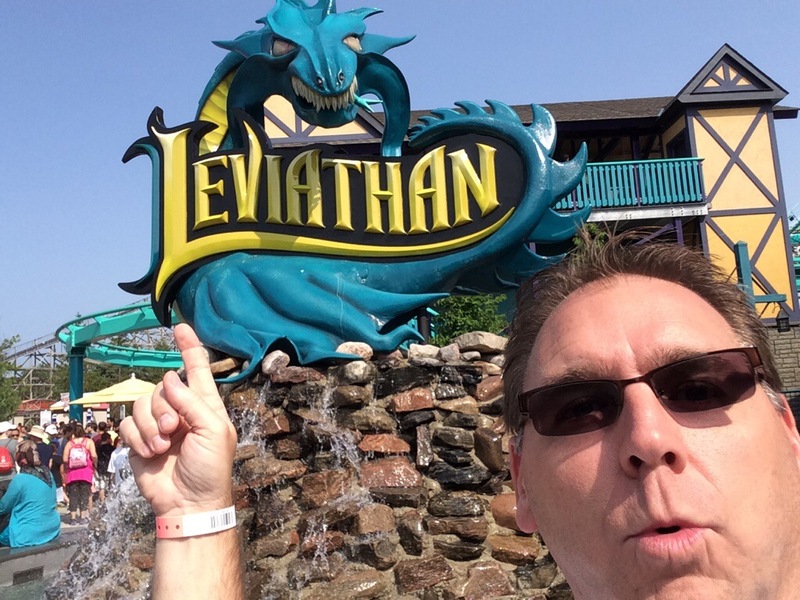 It’s that time of year again, when a few friends and I embark on an epic tour of the U.S. to ride some great rides, eat some great food, and geek out on all things related to amusement parks. 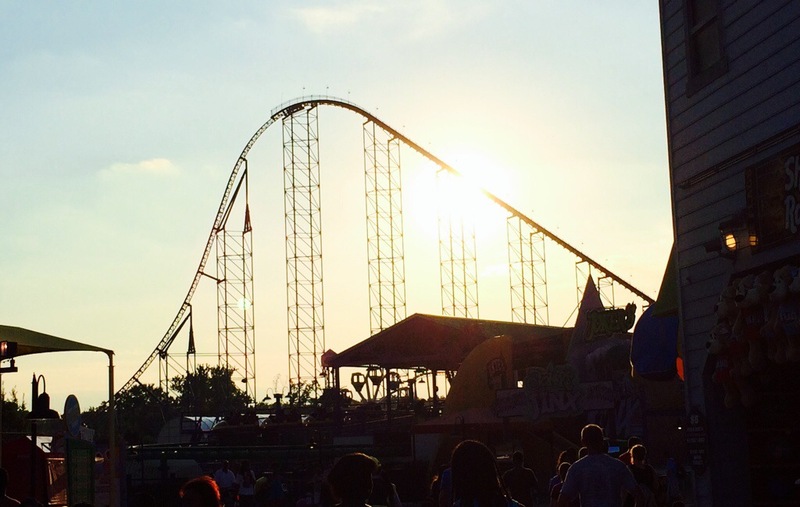 This year, the trip will commence on July 20th in Buffalo, NY, with our first stop at Darien Lake. It’ll “sort of” be my first time there – at least when it’s open. I once interviewed there for an Operations Supervisor position that I didn’t get. Just as well… I wasn’t as ready as I thought I was! Next we’ll get out our passports and head over the border to the Great White North and Canada’s Wonderland. Another first! I am also very excited because this takes me to Toronto… home of my favorite band, Rush. 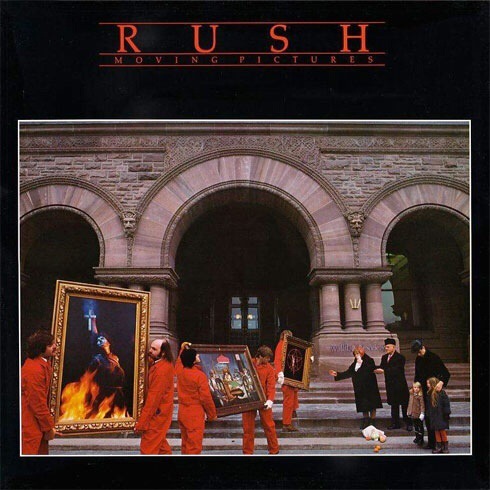 If I ask really nicely, maybe I can get the guys to swing by the Parliament Building, which was the backdrop Rush’s Moving Pictures album cover. How cool would THAT be!?! 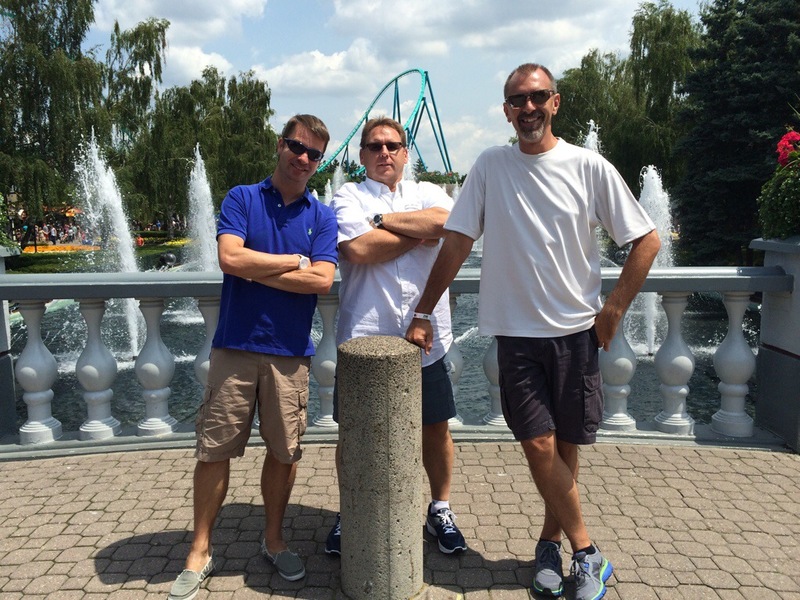 Back in the U.S., the longest drive on the trip will occur between Toronto and Allentown, PA, as we visit Dorney Park. Talon and Steel Force (in the rain) were two unexpected hits of our trip a few years ago. 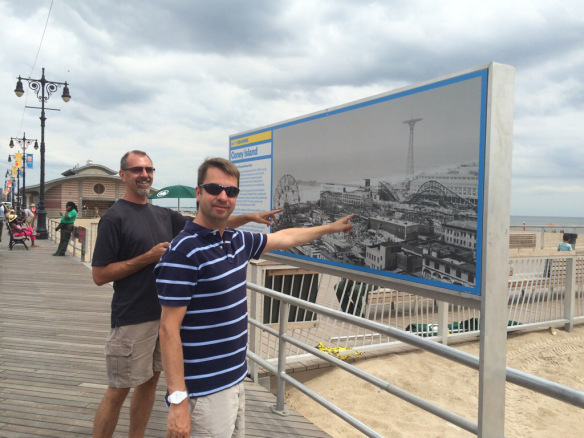 We then REALLY hit the East coast with Six Flags Great Adventure, Luna Park at Coney Island and Morey’s Piers. 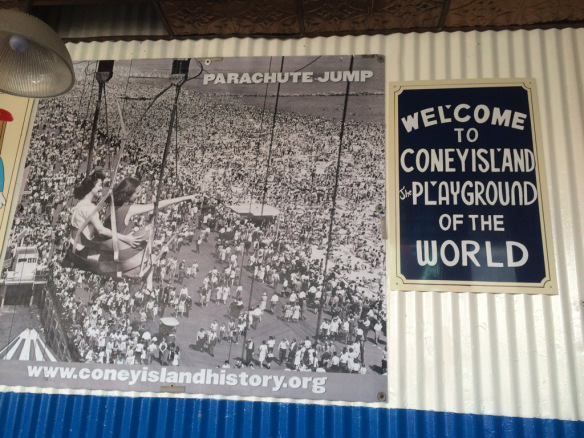 I have not been to Great Adventure in many moons, and both Coney Island and Morey’s will be firsts for me. 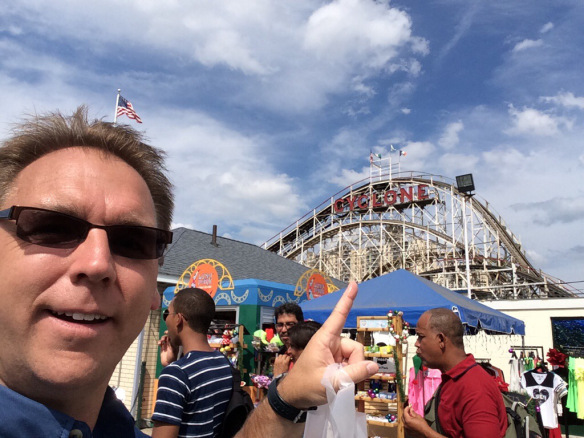 Looking forward to the Cyclone and a great seaside boardwalk! 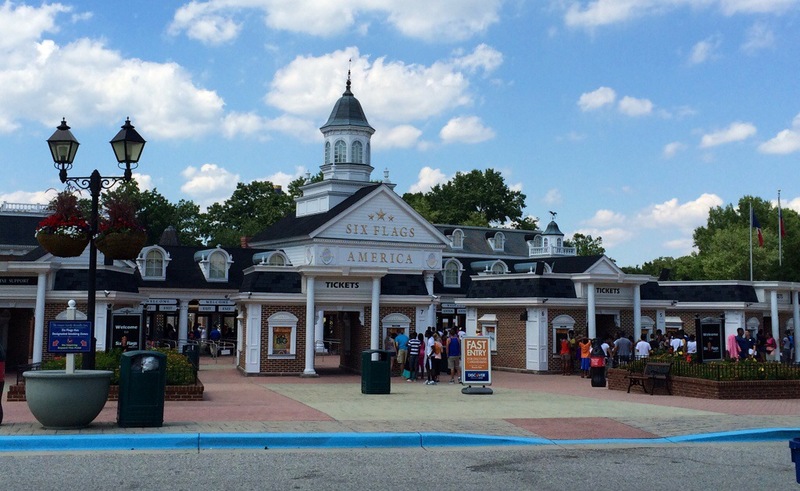 Our last stop will be Six Flags America near Baltimore. Another first for me, but sadly our last stop on the tour. As excited as I am about seeing all these new (to me) parks, I am even more excited about the friends and colleagues I will get to see along the way! If you work or live in these areas – get ready! Oh, and if you have any recommendations for fun places to eat or things to see along our route, don’t hesitate to let me know. We have been known to take a detour to two! If you want to follow along, I’ll be posting about our experiences here on the blog, on Facebook, Twitter, and maybe even YouTube. Connect if we are not connected, so we can connect! It’s the 4th of July, exercise your independence! Today marks the celebration of our independence as a nation, punctuated by cookouts, parades, fireworks, and apple pie. And while it’s extremely important to remember the freedoms we have as a nation, it’s also important to realize the independence that you have as a human being and a leader. Our forefathers knew that independence and freedom did not come easy, and today as I think about what it took to create a free nation, I also think about a phrase that is been running through my mind the past couple of years, and has really been guiding many of my professional decisions. It was certainly a bold move to come to this land and create a new country, and it also takes a bold move for you to exercise your independence as a leader. One of the most important characteristics for a leader to develop is confidence. Confidence in your abilities, confidence in your decisions, and confidence that even if something feels difficult or uneasy, it’s still the right thing to do. And sometimes, that means saying no. 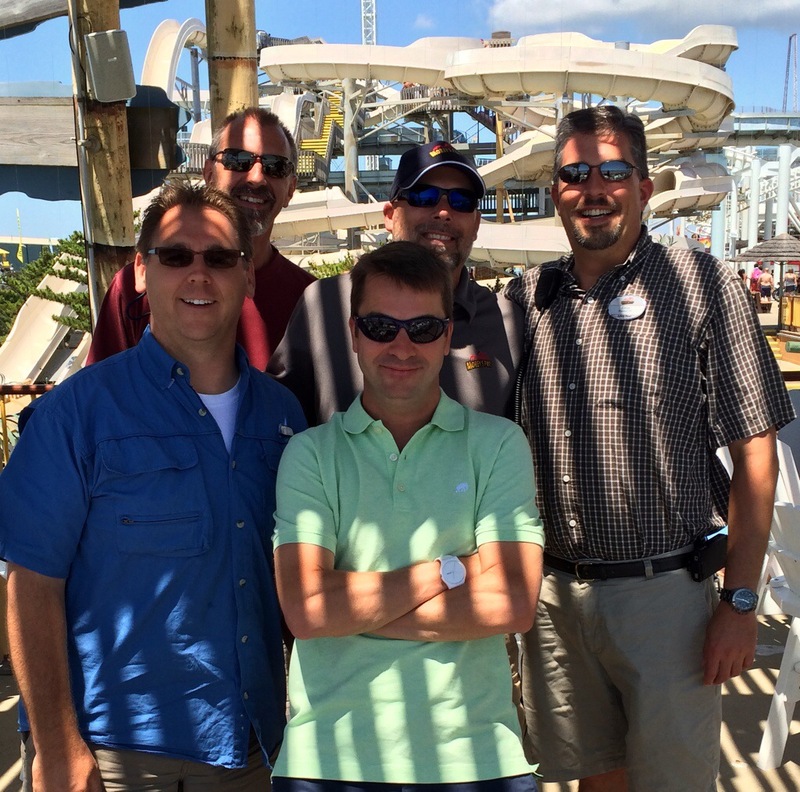 I got the chance recently to work with Jody Kneupper, GM of Wet ‘n’ Wild SplashTown in Houston, Texas. It was great getting to know Jody and his employees, and helping them focus on outstanding customer service. But what led me to this post where the conversations I had with Jody over the few days that I got to spend in Houston. 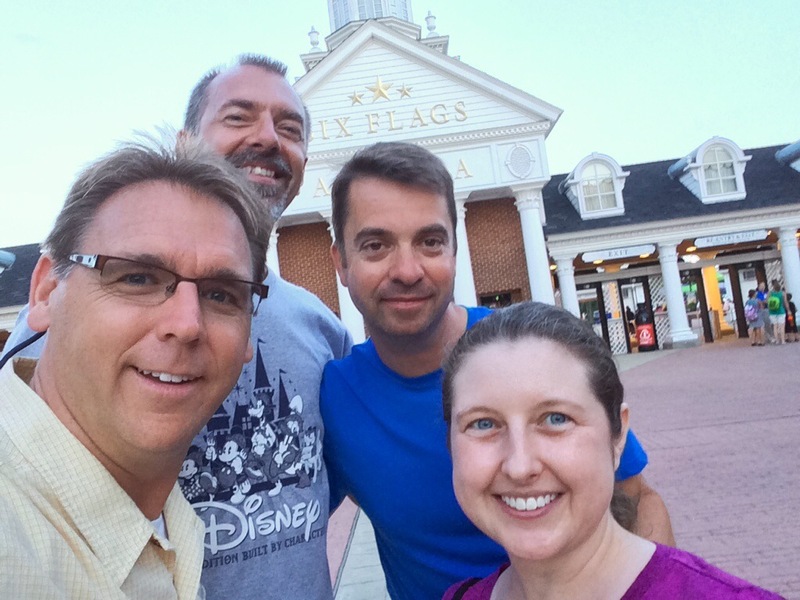 We exchanged stories about growing up in the attractions industry, and I got to hear more about Jody’s experience and the path of his career. 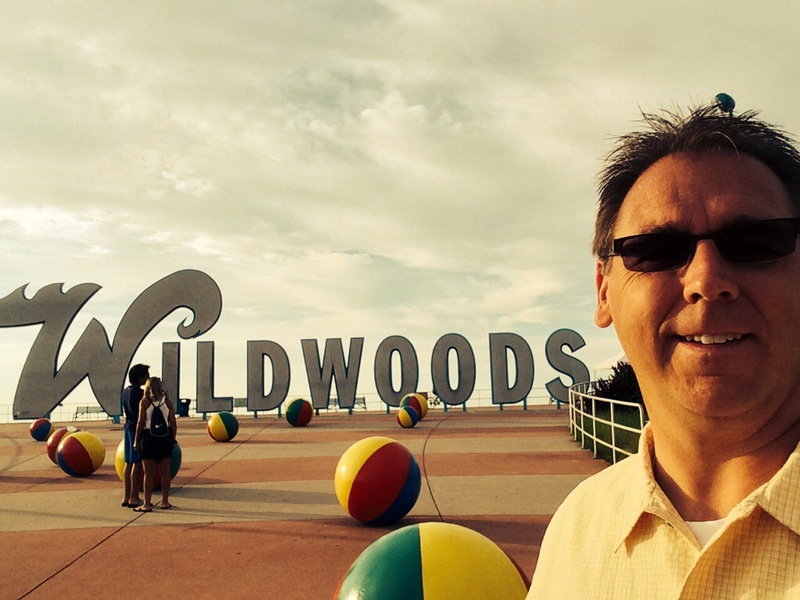 There were a number of decisions that Jody made that led him to where he is now that are probably diametrically opposed to conventional wisdom. They would certainly be considered bold, and ultimately they led to Jody being very happy in the position that he is in. There were a few times in his career that the answer was actually no. This allowed him to NOT take positions that ultimately would not have made him happy. Would these positions have been possible career builders and opportunities to climb the corporate ladder? Absolutely! But for Jody, he knew that these positions just where not right for him at the time, and he had the criteria to back up his decision. This led to him having the confidence to know that it was okay to say no to these opportunities. So, was it bold to say no to these opportunities? Yes! Did it take confidence to know that this independent thought was going to lead to better things in the end? Yes! So thinking about your life or your role as a leader, what sort of bold move or independent thinking have you been considering lately? And by independent thinking I don’t mean starting a new nation, however, doing the things that great leaders do can sometimes feel like that kind of burden. If there are things that you’re holding back from doing, ask yourself the question why? Do you think you’re going to get in trouble? Do you think someone is not going to like your decision? Do you think that ultimately it will hurt you down the road? While these are all valid feelings, they can often create a level of fear that stops us from making a bold move which stops us from being the independent leader that we know we can be. So today, on Independence Day, think not only about the independence of our great nation, but think about the independence that you have as an individual and as a leader, and what you can do exercise that independence, ultimately to make your life, family, or job better.